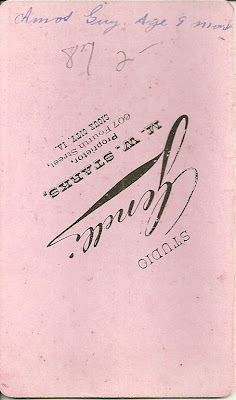 Heirlooms Reunited: CDV of Baby, Amos Guy; Sioux City Iowa studio; Guy middle or surname? CDV of Baby, Amos Guy; Sioux City Iowa studio; Guy middle or surname? 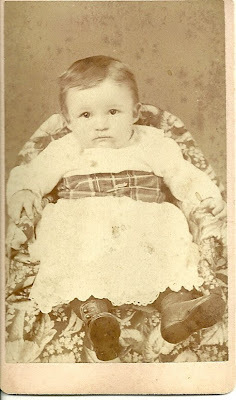 Carte de Visite of a baby, taken by Genelli studio, M. W. Starks, Proprietor, 607 Fourth Street, Sioux City, Iowa. On reverse, the identification reads "Amos Guy, Age 9 months". Is Guy his last name or his middle name? I found an Amos G. Guy, born abt 1876 in Illinois, living later in Iowa. If this is he, then he was the son of Geny Guy and Chatherin Warf - but I wouldn't trust the spelling of either of these. If you have any insights into the true identity of this baby, please contact me so that I can give him the context he deserves.